Winter is the citrus season and the perfect time to try interesting fruits! Tangelos are a deliciously sweet fruit that are a hybrid of a tangerine and grapefruit! They are incredibly juicy. They are wonderfully delicious and makes this upside down cake fabulous! 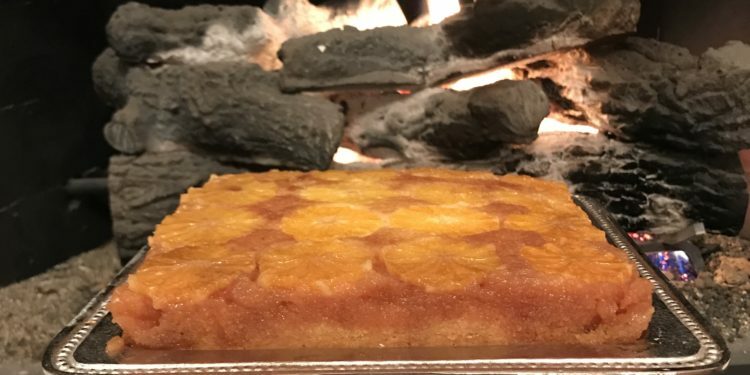 This delicious cake has a bright sunny look to brighten up those winter days! 1. Preheat oven at 350 degrees and grease a square 9 inch pan. Line with wax paper and grease the wax paper. 2. To make the caramel, mix the sugar and water in a small sauce pan and bring to a simmer over medium heat. Cook 10-15 minutes until the caramel reaches a golden color. Add in the butter and salt and stir until melted. Now pour 1/2 of the caramel into the 9 inch pan. Save the other 1/2 of the caramel. Place the tangelo slices in the bottom of the pan. 3. Now combine the cake mixture with an electric mixer. Cream the sugar, butter, zest, extracts for 3-5 minutes. Next add in the flours, baking powder, salt. Last add in the eggs and mix until combined. Now spread the batter in the pan over the tangelo slices. 4. Bake 45 minutes-60 minutes, checking with a tooth pick to see when done. 5. Cool the cake in the pan for 5 minutes and then invert on a beautiful cake platter. Then punch a few holes in the cake and add the extra caramel over the top of the cake for extra flavor!